The state is one of the best brands when you are looking for a company that produces highly durable water heaters in the market. The company has tested its water heaters even in the most hostile environments and tough conditions to make sure that they last for a long period and supply your home with hot water for a long period. Some of the products from this company include gas and propane, tankless, electric, boiler, parts and accessories, and commercial. These products are highly energy efficient and will not fail you when it comes to quality. Rheem is a company that deals in the manufacture and marketing of electric and gas water heaters. The company manufactures water heaters in tankless, tank, and point of use units and configurations that operate on solar water heating systems. There are multiple sizes of Rheem water heaters and they come with varied warranties. The units also have energy-efficient claims that tend to vary by size. You can find these tankless water heaters at any depot around you. The tank water heaters from Rheem are also available online and from various dealers through the network. Rheem is among the few water heater brands that will give you a warranty of over ten years. All the other water heater brands will give you a warranty period of 4 to 6 years. GE electric is a company that manufactures electric and gas water heaters. GE tank water heating systems come in a broad range of sizes. GE is among the most common water heater brands you can find in the market. Its water heater tanks come with energy-efficiency claims that vary according to size and multiple warranty coverage levels. You can get the tank water heaters from this company at Home Depot. Recently, General Electric introduced GeoSpring which is a line of heat pump electric water heaters that is manufactured in the United States. This is a commercial water heater company that has been in the market for more than 100 years. It is an excellent brand if you are looking for reliable water heaters and tankless water heaters. It uses the HVAC systems for enhances reliability. The water heating products you will get from this brand include gas water heaters, electric water heaters, tankless water heaters and hybrid electric water heaters. This is a leading manufacturer of space heating and water heating for commercial and residential application in the United States. Bradford white water heaters produce one of the highest qualities of water heaters on the market. These products tend to cost more than the other brands but offer trouble-free and long-term usage that will help you to save a lot of money. 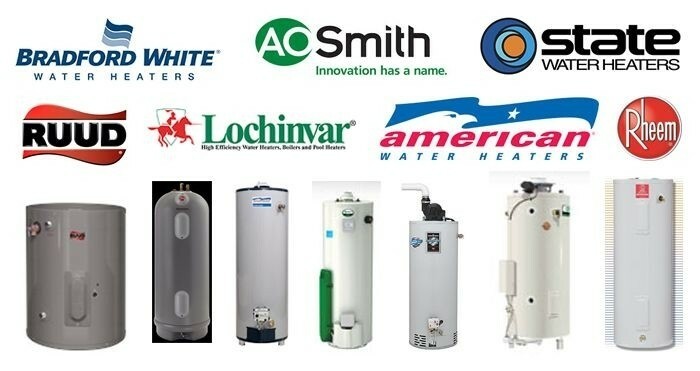 The sale and distribution of Bradford water heaters are exclusively done through authorized distributors and representatives for selling to qualified consumers. Therefore, the company will not sell its products to consumers directly. You can always ask an expert if you need some information about these water heaters. The online reviews for this brand are a bit low. The company will not provide a warranty for its products unless a professional does the installation. You can get a warranty of at least ten years. These units are costlier in comparison to the other similar equipment. Kenmore is a manufacturer of electric and gas water heaters. Like other brands, the water heaters also come in several sizes, hydrosense electrical temperature controlling configurations and Hydrosense. You can also get Kenmore water heaters at Sears. Whirlpool is one of the water heater brands that deals in the manufacture of electric and gas water heaters. These tanks water heaters also come in multiple sizes and power vent and standard configurations. You can get these water heaters at Lowe’s. The last company on our water heater brands is Premier. The company produces water heating accessories that allow homeowners to save a lot of money on utility bills. The company has a broad range of products and cooling and heating appliances are just one of the production lines. You can get nearly every product that you want from the premier. All in all, it is one of the best water heater brands on the market.